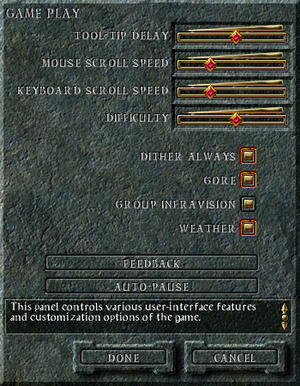 For the Enhanced Edition released in 2012, see Baldur's Gate: Enhanced Edition. Released on 5 CDs or 1 DVD. 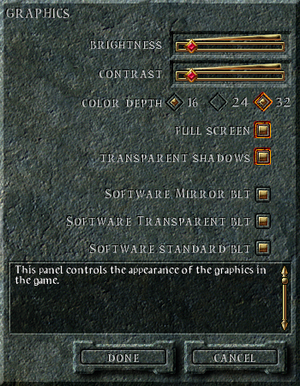 Bundled with Baldur's Gate: Enhanced Edition. Includes the Tales of the Sword Coast expansion. The GOG.com version includes the Tales of the Sword Coast expansion as well as improved compatibility with modern versions of Windows. 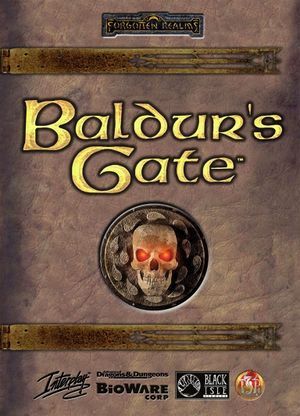 BG1Tutu allows the importing of Baldur's Gate files into the Baldur's Gate II: Shadows of Amn engine. Refer to that page for further details. Baldurdash bugfixes and text update fixes bugs, adds tweaks. Refer to that page for further details. Frame rate is capped at 30 FPS by default. Frame rate can be customized in the game's .ini file up to 60 FPS; however, frame rate is tied directly to the game's clock and changing it will change the game speed. 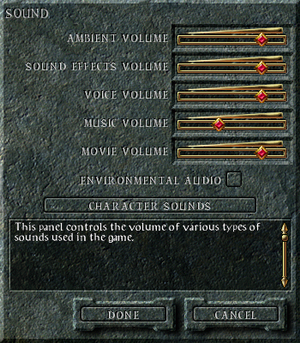 Ambient, Sound Effects, Voice, Music and Movie. Official localization by «Akella» – local retail and GOG version. Try hitting the stuck key again or using Alt+Tab ↹ to switch away from the game. The game will crash if the paths in baldur.ini are too long. Try to install the game on a lower level of the directory tree if you have this problem.